Raleigh, NC Home Designer Tony Frazier caught our eye on Instagram with a shared passion for timeless #architecture. Check our #frazierhomedesign on IG, their website at frazierhomedesign.com, or click on some of their work below to check out their IG page. Here is a really interesting video from The Verge about a technology that made a lot of waves about 15 years ago, spurring things like space elevators and super light armor on to viral popularity. So, where did graphene go? Architecturally inspired by the wind and waves. The modern architecture of the Tierra Patagonia is striking, yet it blends seamlessly into the natural environment of the dramatic Torres del Paine National Park. Set back from the shore of Lake Sarmiento, this beautiful hotel provides breath-taking views of the parks' famous peaks, Lago Sarmiento and the windswept Chilean landscapes. Offering an unusual, unique and breathtaking location, Mashpi Lodge has been designed to present its guests with a once-in-a-lifetime experience. Suspended in the cloud forest of the Mashpi Reserve, this enchanting destination is the epitome of sustainable luxury and recently featured in the BBC series, Amazing Hotels: Life Beyond the Lobby. It is also a member of National Geographic Unique Lodges of the World. This colonial-style resort with Moorish buildings is in landscaped gardens and bordered by two white sandy coves. The authentic décor includes bright blue doors, hand-made linens and local Porches pottery, and there are numerous pools, lakes and gardens to relax in. Take the steps down to a secluded golden-sand beach with access to sun loungers, or hop on the shuttle to nearby Armacao de Pera Beach for a choice of watersports. In the heat, dust and stunning landscapes of Damaraland, there is a sanctuary – Mowani Mountain Camp. Dwarfed by massive ochre boulders, the camp is absorbed into the landscape, making it one with our shared history of life in this prehistoric land. Every soft curve or ragged edge frames the landscape in a different way, as if you are seeing for the first time, every time. Surrounded by thousands of square miles of untouched scenery, Amangiri neighbours the largest Native American reservation in the US. Among the passionate team of Navajo artists working with Amangiri is Eli Secody, who highlights the harmonious living of the Navajo people with this region, its wildlife and the Earth. An Album of Photos from Mike’s travels. Visited by our very own Mike Mecseri, this refinery pulled pot ash out of the Nebraska sand hills for a limited time during World War I. After the war the supply from Europe resumed and this place has become a ruin. It's stout construction guarantees it will be around for awhile. This inspired us to do an abandoned theme for this week’s post. The Casa Sperimentale, also known as the Casa Albero is a concrete and steel treehouse designed by Giuseppe Perugini, Uga de Plaisant and Raynaldo Perugini. It was built from 1967-1975 in Fregene, a small coastal resort near Rome, Italy. It was designed as a holiday home but has been abandoned since 1995. Over the last few years it has been vandalized, used as an illegal party venue, and even acted as the set for a music video by the Italian band 777. The following video is a 3D scan of the entire site and home, as it was in April of 2018. You can also find this interesting place on Atlas Obscura and there are a lot of pictures and 360 degree views on Google. Both Joe and Chris grew up in Missouri, and have visited this State Park. A Subculture unto itself, known as Urban Exploration. There are a lot of YouTube channels dedicated to exploring abandoned places, each with their own tone and philosophy. We recommend The Proper People. We really enjoyed this painting when we stumbled across it recently. We like to learn something new every day, and this week that included a continuing education class on Permeable Paving. This alternative to concrete or asphalt allows water to absorb into the ground instead of running off into the storm drain system. It's a win-win, but we also learned these systems require annual maintenance, essentially running a street-sweeper over them once a year should do it! Here’s a video that describes how the systems works and an article about how it and other pervious pavements could help cities manage storm water runoff problems. In Honor of the Oscars this past week and the possibility of upcoming travel for Spring Break, check out this interactive map that shows actual film locations from various movies, all over the world. You can even submit new locations to add to the map! If you happen to be on your to Chicago in the next few weeks, why not recreate some famous scenes from Ferris Bueller’s Day off? Case Study: Chicken Coops in Turkey by SO? We thought this was a beautiful way to use very standard materials to create a beautiful and functional agricultural structure. “Black Panther took home the 2019 Academy Award for Best Costume Design for outfits that included an intricate collar and crown created using 3D printing. Costume designer Ruth E Carter accepted the award at the Oscars ceremony on 24 February 2019, when the superhero movie based on Marvel comic books received three prizes in total. Among the elaborate costumes worn in the movie were a crown and huge shoulder mantle donned by Queen Ramonda, played by American actress Angela Bassett. You can scroll through a series of infographics and get a really good sense of how we use our space in the United States, seeing each usage compared proportionally to the whole country. “There are many statistical measures that show how productive the U.S. is. Its economy is the largest in the world and grew at a rate of 4.1 percent last quarter, its fastest pace since 2014. The unemployment rate is near the lowest mark in a half century. Learn how to survive using nothing but a pair of cargo shorts and what you can find in the forests of Northern Queensland, Australia. 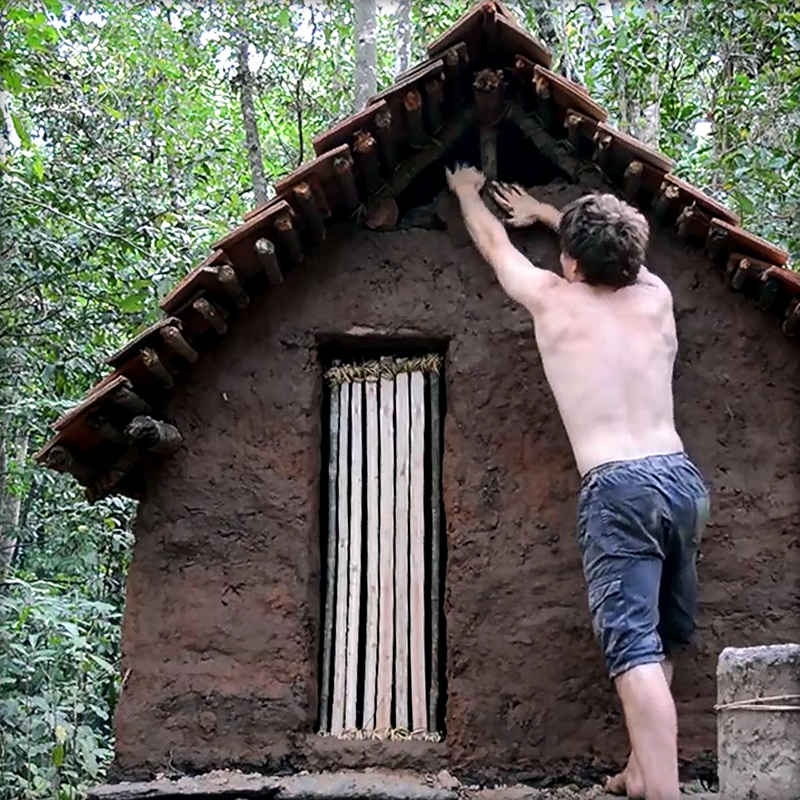 "Primitive technology is a hobby where you build things in the wild completely from scratch using no modern tools or materials. These are the strict rules: If you want a fire, use a fire stick - An axe, pick up a stone and shape it - A hut, build one from trees, mud, rocks etc. The challenge is seeing how far you can go without utilizing modern technology. I do not live in the wild, but enjoy building shelter, tools, and more, only utilizing natural materials. To find specific videos, visit my playlist tab for building videos focused on pyrotechnology, shelter, weapons, food & agriculture, tools & machines, and weaving & fiber." Check out these interesting house plans of all different shapes and sizes. A side note, Solo House II (called 'the wedding ring' in the article) was featured in Netflix's "World's Most Extraordinary Homes" on Episode 1 of Season 2 Part B, "Spain." We highly recommend this show, in which an Actress and an Architect travel the world to tour and stay in some of the most unique homes on the planet. Case Study: Massive, Organic Airport in China. This airport is amazing to look at simply because of the tremendous scale of construction and the complexity of the project. As far as design, it's interesting because airports are almost always additions onto additions onto additions, it seems rare that you get to start from scratch! A quick 3D mock-up and animation in Sketchup to study how a professional office might use an existing office space. Tools of the Trade: Need some inspiration and enjoy fonts? Test out how your text might be perceived as you click through randomly generated Google Fonts, free to use. You can even filter them by serif/san-serif and weight. Things are really starting to come together on this Lake Home near Alma, KS. We’re excited to see the owner’s dream come to life and we can’t wait to share some finished images. "We envisage the new academic space located at the north-east of the new Campus of the Vienna University of Economics and Business as a venue for multiple networking. More than a mere building, the Teaching Center is a learning platform that promotes spontaneous communication while also making it possible to undertake the classes and activities that occur within." Here at Timber & Stone, we also appreciate that it has a slight resemblance to a Sand Crawler from Star Wars while still being an example of excellent design in the world. Technology: Star Trek Replicator technology is not far away. "They nicknamed it ‘the replicator’ — in homage to the machines in the Star Trek saga that can materialize virtually any inanimate object. Researchers in California have unveiled a 3D printer that creates an entire object at once, rather than building it layer by layer as typical additive-manufacturing devices do — bringing science-fiction a step closer to reality." Get inspired by a handful of case studies that are great examples of how amazing landscape architecture can take a building project to a whole new level. A 3 minute video of real masons using cutting edge tech to place bricks in a geometrically complex pattern. 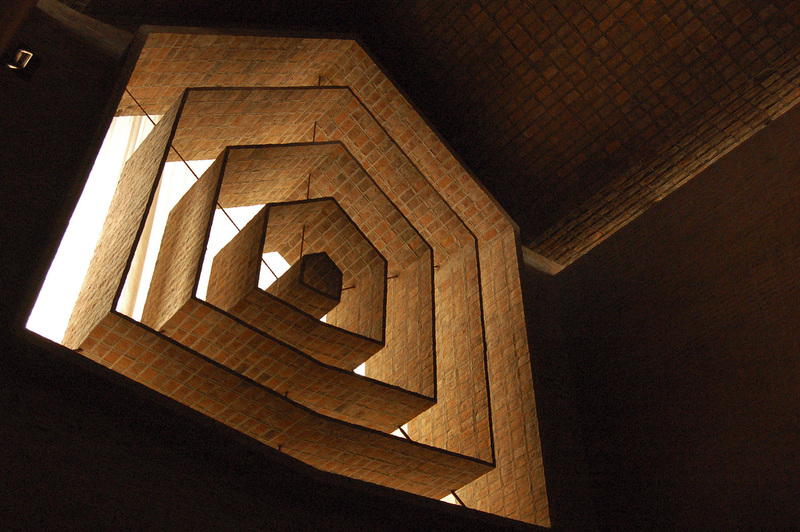 In contrast to cutting edge augmented reality to place bricks above, this architect didn't have computers when he defied gravity and the eye when he created impossibly thin structures from brick. Bonus reading, check out his Wikipedia page. "The race to the top makes more sense to me. The race to the top is focused on design and respect and dignity and guts and innovation and sustainability and yes, generosity when it might be easier to be selfish. It's also risky, filled with difficult technical and emotional hurdles, and requires patience and effort and insight. The race to the top is the long-term path with the desirable outcome." Optimism is important, but it can distort the best laid plans. On your last project around the house, how long did you think it was going to take? How long did it really take? This something we’re trying to understand better in helping us plan. "The planning fallacy….is a phenomenon in which predictions about how much time will be needed to complete a future task display an optimism bias and underestimate the time needed." Apple is know for super modern glass, aluminum, and wood in their products and their building details match that level of care. In this case, the architect Bohlin Cywinski Jackson, helped Apple fuse historic architecture with their modern feel seamlessly. Who is Timber & Stone? What Kind of Architecture Does Timber & Stone Do? What Are Timber & Stone's Core Values? Why the name Timber & Stone? For once, I have a pretty easy answer here… just like sales tax, architects will cost about 8% - 15% of construction costs. So on average if you are planning to build a $300,000 house, your architecture fees will be somewhere between $24,000 to $45,000 for a set of house plans and administration during construction. Typically, the larger the project, the lower the percentage. So million dollar projects will have 5%-10% fees while smaller $100,000 projects will have 10% to 15% fees. This is due to the start-up costs that are involved in beginning any architectural project. A bigger question is however…. I wish I could give you a straight answer here. This question depends on many factors like intricacies and size of the project, architect’s time, and your time. But before we break those down, I want to start with a sign you may have seen hanging on the wall in a variety of businesses from an auto repair shop to a graphic design firm, but this sign would also be right at home in any architecture firm…. What is the Architectural Process? Each architectural firm will have their own spin on specifically what their client experience is like, but we would like to at least introduce you to some terms. This process ensures we get you from where you are now, to us handing you the keys to your space that meets (and hopefully exceeds) your dreams and expectations. How Do You Hire an Architect? It's amazing the number of choices we make everyday. What to eat, what to do, what socks do I wear today? Occasionally we face larger decisions like what house to buy or where to live. Some people are quite decisive, while others need more help. It's amazing how much time we can spend on a relatively small decisions throughout the day. When it comes to building or remodeling your home or business, the number of decisions needing made and moving parts involved are endless…. Timber & Stone is excited to welcome a new full-time member to our team - Chris Chamberlin! His skills and passions include attention to detail, superb 3D modeling, and a penchant for creativity that extends into cooking, construction, gardening, and a passion for sustainable living. He has already had a huge impact on Timber & Stone with the graphic design of our new logo, and his skills and personality have already made him an indispensable addition to our team. He has gained notable construction and graphic design experience since graduating from K-State in 2009. There he studied abroad in Italy and graduated with a Master of Architecture and published an article for his concentration on philosophy in a professional journal. He has whole heartedly taken up the Timber & Stone challenge of riding his bike to work whenever possible, and he can be seen cycling to projects on a vintage 1960's Schwinn that weighs almost as much as he does. When he's not toiling away on one of his intricately detailed Sketchup models, he might be home with his wife Emmy teaching their new son Parker their love of gardening.